Winner of the 2018 Carnegie Medal! 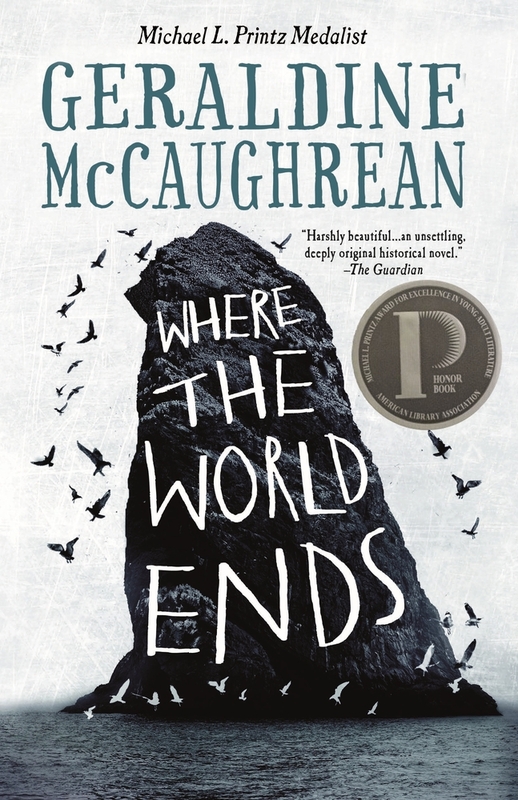 New from Michael L. Printz Award winner Geraldine McCaughrean comes an extraordinary story of eight boys stranded on a rock in the middle of the sea, left to fight for their survival. Every time a lad went fowling on the stacs, he came home less of a boy and more of a man. If he went home at all, that is. Every summer Quill and his friends are put ashore on a remote sea stac to hunt birds. But this summer, no one arrives to take them home. Surely nothing but the end of the world can explain why they’ve been abandoned—cold, starving and clinging to life, in the grip of a murderous ocean. How will they survive such a forsaken place of stone and sea? This is an extraordinary story of fortitude, endurance, tragedy and survival, set against an unforgettable backdrop of savage beauty. Geraldine McCaughrean is the author of the Printz Award winner The White Darkness, the New York Times bestseller Peter Pan in Scarlet, and many other books for children and young adults. She is a two-time winner of the Carnegie Medal, most recently for Where the World Ends. Geraldine lives in Berkshire with her husband John and the lingering shades of all those characters she has invented in her books. Her cottage is under year-round siege from wild birds demanding to be fed. The ducks even knock on the door.